Click to learn more about ESL classes. 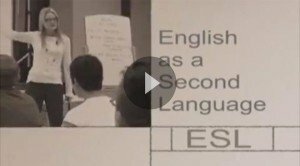 ESL provides instruction in English-language skills including speaking, writing, listening and reading for students whose first language is not English. Flexible classes allow you to progress at your own pace and continue to work while attending classes several times a week. A placement test will evaluate your needs and help provide instruction in areas where you need it most. So whether you’re a professional and English is not your first language, you need to improve your English-language skills, or if you’re learning English to earn your GED® credential, our ESL program can meet your needs.